A small text on Helen Levitt’s photograph New York City, c. 1980. Written for the Capilano Review, Summer 2016. Making street photographs is both a formal photographic game and a test for anyone keen to discover what they really think about the world around them. Of all the genres, it is the most reactive, the camera equivalent to the psychoanalyst’s couch. In turn, the viewer can only ever respond to the work of a street photographer in the same way: looking at their photograph is a formal game and a test of what we might think about the world depicted. Second-guessing the photographer’s intentions may be tempting but it’s rarely satisfying, and when it is satisfying we’ve no way of knowing if our guesses are even remotely correct. 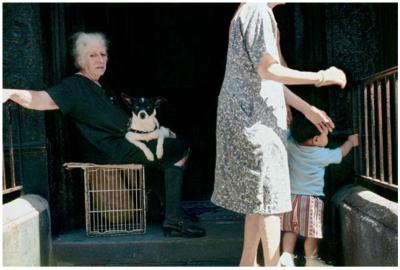 I feel these paradoxes acutely when I’m looking at Helen Levitt’s photographs. To spend time contemplating the apparent ease she had with her camera and with her surroundings is to become disarmed. Am I looking at what she was looking at? In the literal sense, of course not. She was looking at the world through a camera; I am looking at the image she made. But is what I find significant the same as what she found significant, or hoped her viewer might find significant? I cannot know. Photography makes a mystery of intention, for both photographer and viewer. I’m guessing Levitt felt this to be so. But I might be wrong. An uninsistent manifesto. Well, there’s the paradox again. Maybe this was why Levitt was so often drawn to photographing children. Not because they were photogenic or stimulating, and not because they were unpretentious, but because they were uninsistent manifestos—for humanity. Out of the almost nothing of us, out of the almost nothing of daily life, something will emerge. A child into an adult. A photograph into a work of art. 1 James Agee, in A Way of Seeing by Helen Levitt (New York: Horizon Press, 1960), n.p. This issue of the Capilano Review, Eye to Eye (TCR 3.29), a co-production with Presentation House Gallery, featuring close to fifty writers responding to exactly thirty-five photographs curated from the collection of Andrew Gruft and Claudia Beck. Presented as part of PHG’s recent exhibition Eye to Eye, the photographs, books, and media art by historical and contemporary artists range from iconic vintage prints and photography books to recent photographic and moving picture works. With contributors invited to “play the part of the dramaturge, the essayist, the poet, the historian, the critic, or the jester,” what we offer here is a (very) special issue decidedly stranger and differently illuminating from your standard exhibition catalogue. With photographs by Henri Cartier-Bresson, Richard Learoyd, Daido Moriyama, Helen Levitt, Richard Maynard, Miroslav Tichý, Aaron Siskind, Robert Capa, Omar Victor Diop, Garry Winogrand, Xavier Miserachs, Otto Steinert, Hiroshi Watanabe, Lynne Cohen, August Sander, Robert Frank, Mike Grill, Scott McFarland, Eikoh Hosoe and Yukio Mishima, Michael Morris, Eugène Atget, Agustí Centelles, Katy Grannan, Stephen Waddell, Raymonde April, Peter Hujar, Bruce Davidson, Al McWilliams, Christos Dikeakos, Kevin Madill, and Anne Collier.